On August 14, 1886, a group of gentlemen gathered in Amsterdam with the purpose of establishing a “Committee for the Championships of the Netherlands for gentlemen amateurs in single scull outriggers”. The word “amateur” served to differentiate men who were paid to row from those who rowed for pleasure. 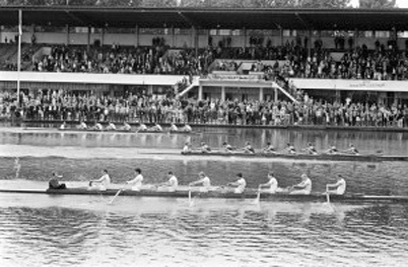 The Committee allowed amateurs to participate in their new annual regatta in the Men’s Single Sculls. The first regatta took placeon September 25th, 1886. Until 1912 the regatta was known as the International Dutch Open Single Sculling Championships. The regatta gained wide international renown. 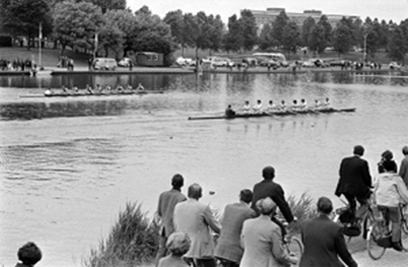 In 1931 the regatta was moved from the river Amstel to the temporary race course in Sloten, near Amsterdam, until it found its long-term home on the brand new Bosbaan in 1937. During the 1980’s, the Holland Beker experienced competition from a growing number of international regattas, which made it difficult to attract elite international athletes. After some German victories, several Dutch champions were celebrated in the late 80’s and early 90’s. There is a gap in the regatta’s history in the years 2001 and 2002. Only after the refurbishment of the Bosbaan in 2003 did the Holland Beker Regatta Association breathe new life into the regatta. The organization now included the Royal Maas Yacht Club Rotterdam – replacing the Royal Netherlands Yacht Club as the organizing group in 1994-, the Amsterdam Student Rowing Club Skøll and the Royal Dutch Rowing Association. In 2004 the name of the regatta changed back to the Koninklijke – Holland Beker. As the most renowned Dutch international regatta, scores of elite rowers from all over the world make their way to the Netherlands to compete for the championship title. In 2019 the Koninklijke – Holland Beker organization is proud to host the World Rowing Cup III in Rotterdam. A city of distinctive character, Rotterdam is energetic and constantly changing. Rotterdam and its inhabitants never shy away from experimentation. In fact, they would rather seek it out. Rotterdam has many faces. Like the Nieuwe Maas, a waterway that represents a powerful symbol for the city’s constant motion. Rotterdam is a city where the Make it Happen mentality can be seen and felt. With people and organizations that make a clear choice for Rotterdam and add their own take on that Rotterdam mentality and ‘can do’ spirit. Whether they live here, are just visiting, or are running your own business, or studying here. The Rotterdam mentality and DNA are best captured in words like international, entrepreneurial, raw. Worldly, pioneering, no-nonsense. This is the foundation for city marketing under the umbrella of Rotterdam Make It Happen. Every day, many Rotterdammers add their own take on Rotterdam Make It Happen. By pursuing innovation and entrepreneurship. By collaborating and connecting. By moving forward and having the guts to walk ahead of the crowd, being bold and sticking out their necks. By thinking about sustainable solutions. By discovering, experiencing, taking action.